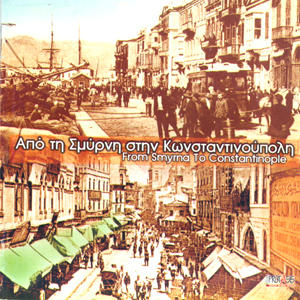 Popular, well-known tunes from Smyrna and Constantinople such as "S' agapo giati ise orea" (I love you because you are beautiful), "Pergamos", Aivaliotiko", "Politiko Hasapiko" make up a unique collection of traditional Hellenic music. Enclosed in the album there is an 8 pages inset in English, narrating the story of Smyrna in relation to the lyrics. It is accompanied by photos, texts and historical data of that period.